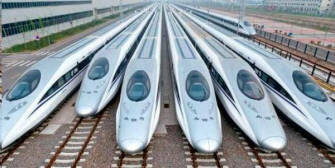 China Focus: Full speed ahead for high speed rail expansion. InterBering Service Mark was registered with US Patent & Trademark Office. Trans-Siberian Railroad Getting New Lease on Life. Connecting America And Russia By Railway Tunnel. Fyodor Soloview, Director of Interbering, LLC received support from Russian Railways to build US-Russia railroad. Join Russia and USA by Rail Tunnels under the Bering Strait? Voice of America. InterBering, LLC Certificate of Membership . To get it, click here and apply. at World Trade Center, Anchorage . "Siberian Platform: time for new solutions"
and the Krasnoyarsk Economic Forum, 19-22 April 2017. Economic development of such an immense geographic area as Siberia and the Russian Far East could not fail to impact the entire global economy. This is due not only to its geographic size but also its strategic location between major industrial powers located on three continents -- and the fact that Russia itself has long been economically prominent. Historical development has positioned Russia as the only portion of the Earth's surface which can link together Europe, the United States, China and Japan along with other economically significant neighboring countries. The special challenges which intervening bodies of water such as the Bering Strait, the La Perouse Strait and the Nevelsky Strait present are being met with innovative ideas for connecting and upgrading existing transportation infrastructure. It's possible to conclude that Russia's central position between the land masses of Europe, Asia and North America naturally qualify it to act as a "supervisor" of trade between nations. Utilizing Siberia and the Russian Far East to host railways linking continents and their exports also suggests that undersea railway tunnels of the type now connecting Europe with Britain would not only be feasible but could also create valuable new sources of revenue for Russia and further its own domestic development. Citing historical analogy, Russia might be looked upon as a potential "crossroads" country playing much the same role as the Mediterranean Sea did in providing early civilizations along its shores with a means to cost-effectively transport goods and develop trade. An undersea railway tunnel or bridge linking Russia with Alaska is the key piece needed to complete the analogy. The value of a railway between Russia and the United States would be so great for the economic future of Russia that failing to build one should be seen as economically indefensible. Had such a transportation corridor existed for example in the 1930s, Hitler would have been less likely to begin a war with the Soviet Union -- as the United States could have more quickly and efficiently supplied weapons and other assistance. Furthermore, the United States cannot presently rely on low-cost rail transport in trade with Europe and the Asian countries, and its trade balance is considerably affected. Russia's trade with Europe is over 30 times higher than with the United States, largely because a system of roads and railways promotes cheaper and faster delivery of export and import goods while also offering convenience to businesses. Consider also that this advantage might be even greater if not for sanctions imposed on Russia because of political disagreements and protective trade policies promulgated by the United States: measures formulated at least in part to benefit America's balance of trade with Europe and impede Europe's trade with Russia. But if the United States had the capacity to deliver exports to Russia and countries in Europe and Asia by lower-cost rail links, she might instead favor the greater economic stability and mutual growth which better relations with Russia would ensure. 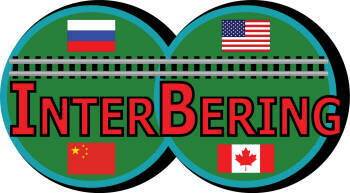 The main priority for the development of Siberia and the Russian Far East in the next 15-20 years ought therefore to be the construction of a railroad connecting Russia and the United States across the Bering Strait. A proposed route for this new railway, from the right bank of the Lena River where the existing Siberian railway ends at the rail station in Nizhny Bestyakh, is about 3,850 km (2,392 miles). Along with the new railway might also go a modern highway. The construction of power plants on the Russian side would ensure electricity for Russian railway locomotives, including power transformers within the 100 kilometer long tunnels under the Bering Strait. This power supply is discussed in a paper by Thomas Scholler, a project manager with the Energy Department of Swiss Rail (SBB AG): http://www.interbering.com/InterBering/Electrical-Power-Supply-of-the-Bering-Strait-Tunnel-by-Thomas-Scholler-Sept-20-2015.pdf . The railway project should include construction of a Russian customs depot with the capacity to simultaneously inspect a dozen passenger and freight trains going in each direction. Perhaps a combined U.S.-Russian customs depot could be built on the Alaskan side with its flatter terrain. Along with the customs inspection of cargo, the depot would also be the point where cargo is transferred from diesel-powered American locomotives to Russian locomotives using electrical power on track of 1,520 mm Russian gauge for the trip through the undersea tunnel. 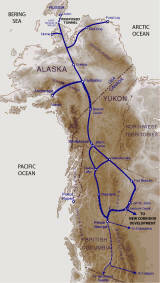 Financing the construction of the connecting railway, along with a Bering Strait tunnel, would cost an estimated $135-$150 billion dollars in private and public funds coordinated through the corporation InterBering, Inc., which I created in the state of Alaska in 2010 for the implementation of this project. But this initiative must first be supported by an agreement between President of Russia Vladimir Putin and U.S. President Donald Trump and approved by the Government of Canada, through which a significant portion of the connecting rail line will pass. Major investors in the project may well include public and private entities in China, Japan, South Korea and Europe. It is reasonable to think that construction of the connecting railway and the Bering Strait tunnel could be completed in 15 to 20 years. Many sections of the railroad could be built simultaneously, and in Alaska existing railways could be included in the project. Excavation of the undersea tunnels by tunnel boring machines would produce crushed basalt and other types of gravel (approximately 50 million cubic meters / 55 million cubic yards) which could be used in the construction of the railway beds extending beyond each end of the tunnel. The quantity of this gravel product will be sufficient to lay a rail bed 20 inches (51 cm) deep at a width of 41 feet (12.5 meters) for a two-lane railroad extending 4,873 miles (7,843 km) in length. This will cover the distance from the Bering Strait to Canada in North America and much of the necessary access railway in Russia, while significantly reducing the cost of construction. The option of low-cost ground freight and passenger transportation between Canada and the United States on one side of the Bering Strait, and Russia, China, Japan and Europe on the other side would greatly benefit global trade by significantly reducing transportation costs and expediting the export of goods for all participating countries. Transcontinental railroads, whether conventional or high-speed, passing through the length of Russia, might likewise enhance to an incalculable degree Russia's role in international trade and therefore her own political and economic interests.